Not great for making movies, but an excellent black box solution. Using a camera to log your driving in the event of an accident is an increasingly popular pastime, especially for bikers and cyclists. But the Roadhawk DC-1 takes the concept of in-car black box to another level. Put simply, the Roadhawk DC-1 might turn out to be the difference between keeping or losing your no-claims bonus. It might even make the difference in a serious road-accident related court case. Roadhawk DC-1: What'll it do? In simple terms, the Roadhawk DC-1 records audio and video. Where things get clever is by adding GPS functionality. That enables the speed and location of your car to be logged all along the recorded route, too. Roadhawk has also thrown in a G sensor. The upshot of all this is that you can record and later review journeys in forensic detail. You can even play them back alongside a Google map display of the car's location. Several benefits come out of this. You've a log of exactly what happened in the event of an accident, for starters. You can also use it to plan or share routes, improve your driving and more. What it's not, however, is the optimal device for recording snazzy in-car videos. The video is limited to 640 x 480 pixels at 30 frames per second. Budding movie makers will be better off with something like the GoPro car kit. Roadhawk DC-1: What's it like? 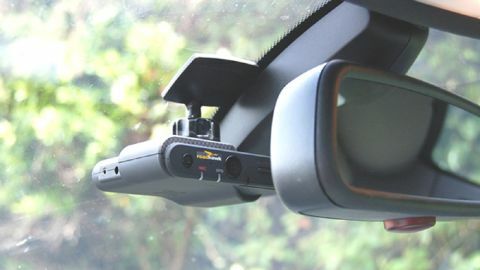 Compact and fairly discreet, the ideal mounting position for the Roadhawk DC-1 is probably behind the main rear-view mirror. Power comes from a standard cigarette lighter adapter, but you can also hard wire it to the car's power circuit and cut down on the cables. Not an expensive job and well worth doing, we reckon. The Roadhawk DC-1's safety aspect is covered by automatically recording when the car is started. It records in a constant loop of up to six hours and has an emergency button to protect files from being overwritten. You can also set the Roadhawk DC-1 to protect data when the g-force sensor detects an accident or impact. Obviously, this isn't a feature we were fully able to test. It's all recorded onto a 4GB SDHC memory card which you can remove any time you want to review the data. There's a software app for doing just that, which includes the aforementioned Google maps functionality. It's not a pretty app, but it gets the job done efficiently. You can also view the video in most media players, but you won't have access to the speed and location data. As for the quality of the video, it's not going to worry a GoPro. But it's absolutely fit for purpose thanks to a usefully-wide 125 degree field of view. Achieving the best setup for the Roadhawk DC-1 does require some wiring. But it works pretty well just sticking it in the screen and plugging into the lighter socket. Once you're up and running, the auto record and accident features mean you can leave it to do its thing and basically forget about it. This is critical, as you can be sure the one time you really needed to have it running, is the one time you'd forgotten to set your camera to record. You can get black box apps for phones, of course. But the Roadhawk DC-1 is a more permanent solution that can be hard wired for constant power supply and do everything without you ever needing to think about it. All told, it's a great way to protect yourself on the road, though it's worth pointing out that it will record your own bad driving just as efficiently as everybody else's. But then maybe the knowledge that it's all being recorded will encourage you to behave a little better behind the wheel.